“Some days are diamonds” as John Denver once sang. This morning I received an email from my 3rd cousin, Sheila, in Canada. 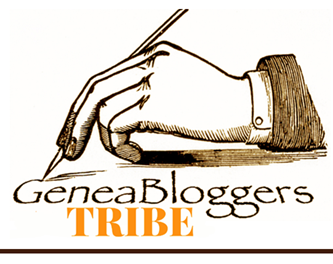 We share common ancestors Duncan and Annie McCorquodale (various and many spellings). I had sent Sheila a link to an amusing parking sign for McCorkindales and she repaid me with a gold mine! Don’t you just love family networks!! 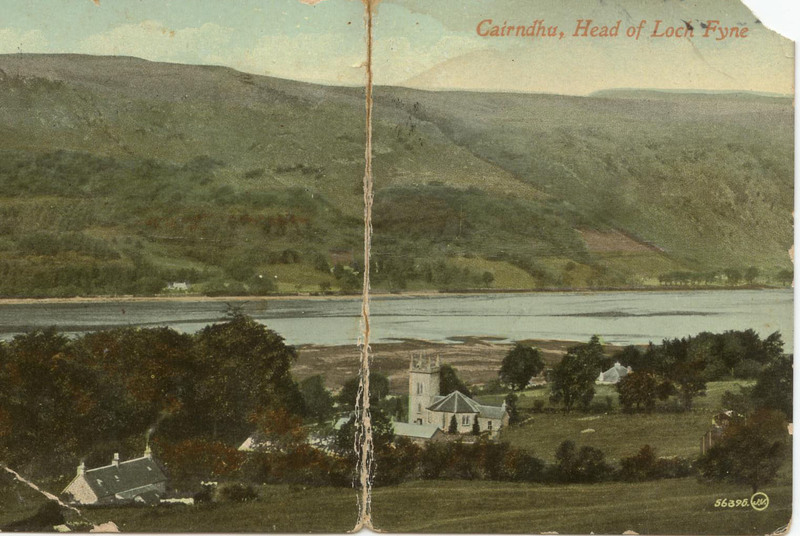 Sheila had unearthed a wonderful web site for the village of Cairndow which lies at the top of Loch Fyne in Argyll/Argyle, Scotland. It’s called “Our Houses, Their Stories” and has been supported by the Lottery Fund UK. The postcard from my grandmother’s collection. Now I’ve been researching my McCorkindales/Macquorqodales/McCorquodales for over thirty years and I’ve also fortunate enough to have visited Cairndow several times. 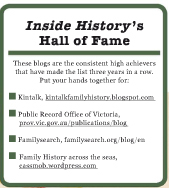 And yet, this web site has opened up our family history in a completely different way. Despite my previous background research into various documents, this site has made the actual location of some of the houses now unambiguous. Back in 1989 I’d taken a left towards Strachur to check out my Isabella Morrison’s (later McCorkindale) birthplace. 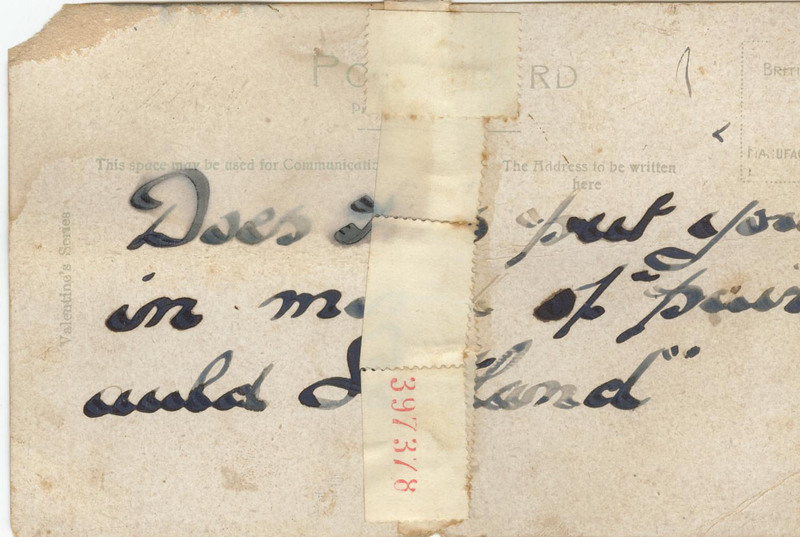 It was only on my return back to Oz that I had a lightbulb moment, looking at a postcard I’d inherited from my grandmother saying “does it put you in mind of puir auld Scotland”. 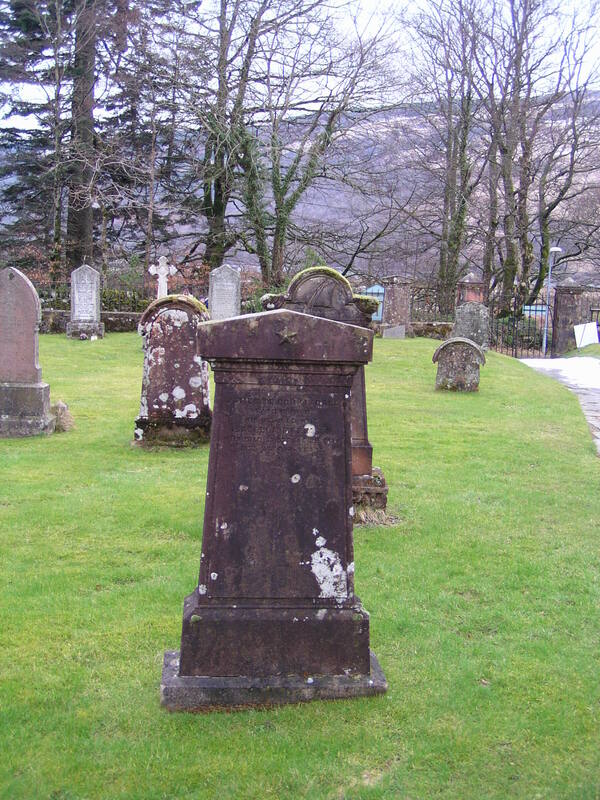 You can well imagine I was ever so frustrated for not putting this together earlier – because Isabella is actually buried in the Kilmorich churchyard at Cairndow: pictured in the centre of the postcard. 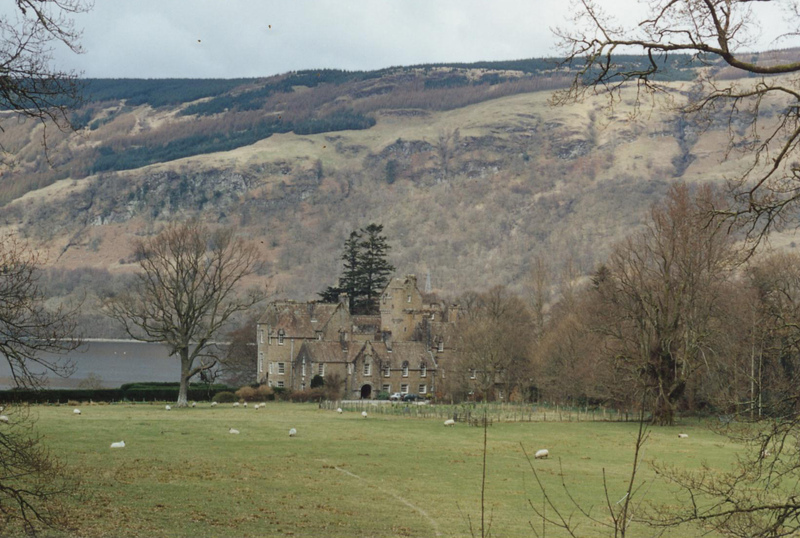 Not the original Ardkinglas building but it shows the magnificent location. Needless to say I’ve also done all the census records for the family, emailed and met with the estate manager for Ardkinglas estate and walked the property’s wonderful gardens. I’d visited the East Lodge gate house (thanks to the estate manager) and marvelled that widower James McCorkindale lived in such a tiny place with his adult daughter, Euphemia, before being moved to the Greenock workhouse where they both died. Isabella Morrison McCorkindale’s gravestone is right near the door to the Kilmorich church. I’d asked where Baichyban was precisely (having acquired a topographical map). And yet, despite all this research, there were still ambiguities in my mind eg which house in Strone did they live in, was that Baichyban house too recent? The website also indicates that James, and another daughter, Isabella, had also lived in the North Lodge which appears to have been one of the houses at Strone. Local knowledge is a wonderful thing! All of a sudden the magic box opened and so much became clearer. The website includes the location of each house mentioned on a topographical map (Alleluia!) as well as the names of all the residents since the 1841 census. My James McCorkindale (var sp) appears regularly as he lived there from 1841 until shortly before his death. My suspicions are even stronger now that his daughters are among those listed as servants in neighbouring houses and cottages. A photograph of Duncan McCorkindale kindly given to me by a cousin many years ago. There’s so much here for me to explore further but I couldn’t be more thrilled with this discovery and I’m so grateful to Sheila for bringing it to my attention. I’ll be offering to share my photo of Duncan McCorkindale, who was a young lad in the 1851 census, with the local committee. Duncan undertook the fairly standard migration to Glasgow where he became a cabinet maker. 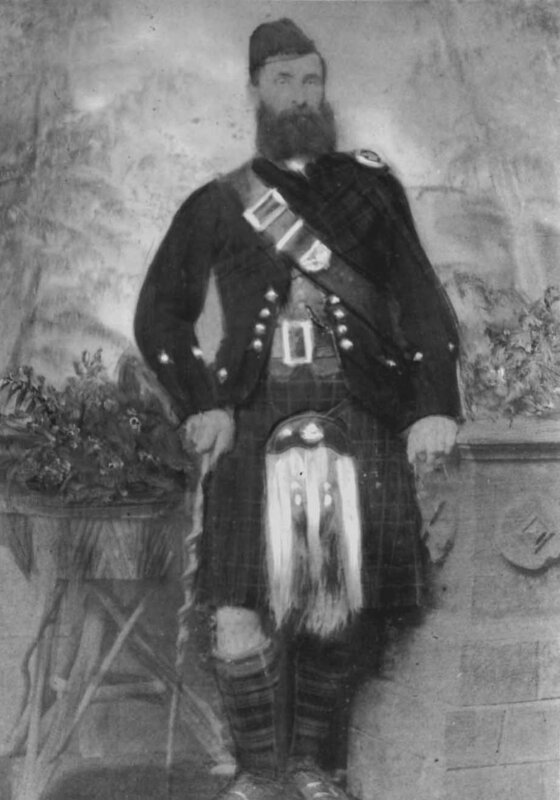 He died relatively young and his second wife and children emigrated to Australia. Waiting patiently for me in Mum’s new unit, is a chess table built by Duncan as part of his apprenticeship, or so the story goes. Other hand-crafted items have been shared with various Aussie family members. 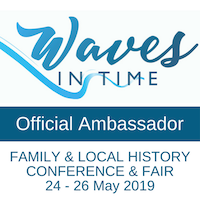 Even if you don’t have relatives from Loch Fyne, do have a look at the website to see just what can be done by a collaboration of family and local history: you can follow the links below. I’m so impressed! The Houses (with details of who lived in each house between 1841-2007. The People (as yet the weakest link, but I have no doubt this will change. Congratulations to all the people behind this fantastic enterprise and thanks again to Sheila!